Andersson served as CFO and oversaw a review of Lindab's cost structure during his 12 years with the Swedish company. 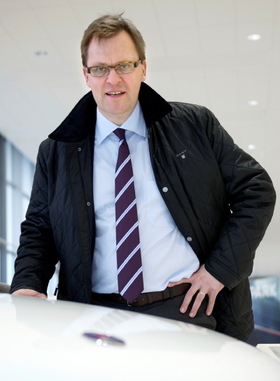 Saab Automobile AB has named Nils-Johan Andersson as its new chief financial officer in part because of his experience at a publicly traded company, the automaker said Wednesday. Spyker Cars NV, which owns Saab, plans to tell shareholders in May whether it intends to list the Swedish car manufacturer on the Swedish stock exchange, Spyker CEO Victor Muller told Bloomberg last month. Andersson, 48, comes to Saab from Lindab AG, a Sweden-based supplier of building and ventilation products to the construction industry. During his 12 years with Lindab, Andersson served as CFO and oversaw a review of the company's cost structure that improved profits, Saab said in a statement. “His experience and skills will be great assets to Saab Automobile as we continue to establish ourselves as a successful independent company,” Saab CEO Jan Ake Jonsson said in the statement. The statement added that the extensive experience Andersson has in working for a public company is "vital to Saab Automobile ever since it was bought by Amsterdam-listed Spyker." Muller last September told reporters that Spyker may add a listing in Stockholm to its Amsterdam Euronext trading by April 2011. The company's annual general meeting, where the issue now will be discussed, will be held May 19, he said. The Dutch supercar maker bought Saab from General Motors Co. for $400 million in cash and preferred shares last February, as Saab was on the brink of shutting down. The Trollhattan-based manufacturer aims to sell 80,000 cars this year and 120,000 in 2012, which is when it wants to become profitable. Saab sold 31,696 cars globally last year, down from 39,800 in 2009. In the United States, 2010 sales plummeted to 5,445 units from 8,680 the year before. European sales fell 19 percent to 21,490 car, according to market researcher JATO Dynamics. Andersson, who will succeed interim CFO Karl Lindstrom, will be based at Saab's Trollhattan headquarters and will report to Jonsson. His start date has not been finalized.